Good news is that Nopalin can act as a "cure-all", but really there are scientific explanations for all these facts. Nopal plant is a rich source of vitamins, minerals, contains 17 amino acids, of which 8 are essential (that can not be synthesized in the body). 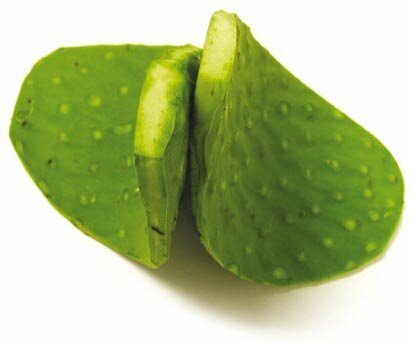 As a fibrous plant, Nopal contains soluble and insoluble dietary fiber. Studies show that Nopal really improves the functioning of the immune system by supporting the main roads of eliminating unnecessary substances from the body, while providing natural easily digestible protein, ascorbic acid and bioflavonoids. Nopal is best known for its properties that provide a natural way to control and weight loss, at the same time supplying a broad spectrum of nutritive for the body. Prevents the accumulation of fat at the same time enhances the breakdown and excretion. Nopal improves mood and reduces appetite. Since increases the feeling of satiety, thereby reduces the need for snacking between meals. Plant proteins of Nopal support the return of salt and water from the tissue into the lymphatic system and blood vessels, especially the connective tissue of the skin, which greatly reduces cellulite and fluid retention. Nopal lowers blood sugar because it increases the sensitivity of peripheral tissues to insulin and thus better crossing of sugar from the blood into the cells where it will be used for energy. Nopal reduces the amount of total and harmful LDL cholesterol and triglycerides in the blood, accelerating their metabolism in the liver and excretion of bile. Next use of Nopal is that it supports healthy diet with regular physical activity, which will not fail result is loss of body weight, restore energy, fitness and figure correction. At the same time we have the normalization of blood sugar and blood fat levels and thus reduced risk of heart disease and circulatory organs. If combined with chromium (Nopalin with Chromium Max or better Cholestone) effect in terms of preventing and eliminating arteriosclerosis plates in the blood vessels is increasing. On our continent and in North America colon cancer is in 2nd place after occurrence and mortality. The biggest reason for this is reduced motility intestine and chronic constipation and this means that in the gut then is 3-8 undigested meal. In such a very long time interval as the food remains in the intestine has time to all toxics-carcinogenic effect on the bowel. Rich content of plant fibers Nopal exerts physiological, biological and microbiological effects on the digestive organs. These are: slow filling and emptying of the stomach, rapid and frequent bowel movements, increased weight and soft stools, binding of carcinogenic substances, heavy metals, and bile acids, and decreased absorption of cholesterol and sugar from intestine Fibers in the diet strongly promote colonization by "friendly" intestinal bacteria and addition of Nopal supply the body with minerals. Vegetable fibers and mucous matter of Nopal support the control of secretion of gastric juice and give additional protection and mucous membranes of the stomach from corrosive effects of stomach acid. When it comes to maintaining the health and vitality, it should be noted seven elimination pathways. These are: liver, kidneys, lungs, intestines, skin, blood and lymphatic system. Ingredients of Nopal - naturally available vitamins, minerals, bioflavonoids, amino acids, fiber, etc. help detoxify the body and help the function of not only the liver but also the whole body. Ammonia in the body, free radicals and toxins from the environment, such as alcohol and tobacco smoke - that suppress and stifle the work of the immune system - they are all mostly removed with the help of Nopal. Nopal acts as a diuretic stimulating the flow of urine through the renal contributes to neutralization of toxins. Nopal helps clean the bladder and lymph system and has a beneficial effect on the prostate. Promotes secretion of sweat and thereby is reducing elevated temperature. Nopal is a great dietary supplement for versatile purposes. It can be considered a great helper in health and healing of the body when its balance is upset. Nopalin (lat. Opuntia) - a new star among the cacti! We proudly present the new star among the cacti, our Nopalin (lat.Opuntia). 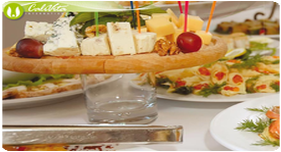 For CaliVita® members only at the best price! For only 23.50 EURO you get 200 pills pure fiber from Nopal (0.12 per tablet !!!)! 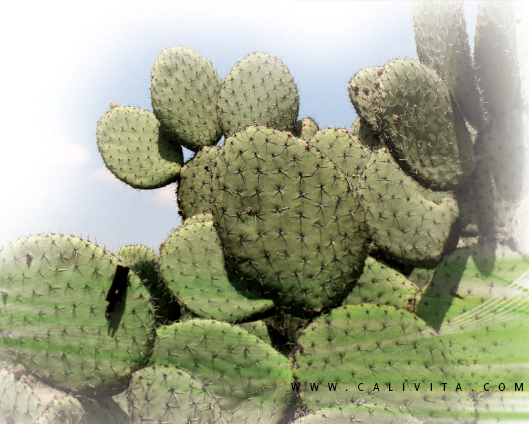 Bring this highly nutritious food in your daily diet and discover why we are back in 2002 recognized and introduced Opuntia (Nopal) in the range of CaliVita products and why it has become an indispensable part of our daily diet. We recommend using fiber NOPAL / Opuntia, because they have an incredible ability to bind fat and remove it before it is absorbed into the body. 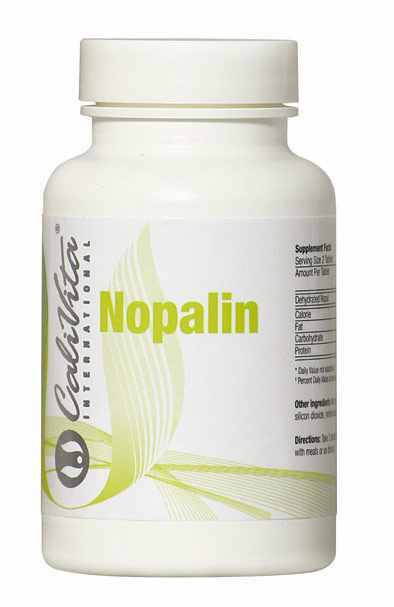 Using nopaline - Opuntia cactus, it is less accumulation of fluid in the tissues, so Nopalin used with great success, as already mentioned in the treatment of obesity, and cellulite. See combination! Use of Nopalin very simple. It can be taken several times a day, in your the most suitable combinations. To reduce appetite, regulating stomach acid and protect the mucous membranes - 3-4 tablets Nopalin with as much liquid before or between meals. To bind fat - 3-4 tablets Nopalin with 1 cup of liquid after a meal. Instead of a meal - 4-8 tablets Nopalin with plenty of fluids between meals. Pay attention to other tested combinations! Cardio combination! Twiggy combination! Urban combination! For the reduction of elevated LDL cholesterol, improve digestion and peristalsis, reduce fat, increase "good" cholesterol and overall cardiovascular protection. Did you know that more than 50% of deaths in most of the european countries is due to problems of the heart and blood vessels? Start now to take care of your cardiovascular system! Provide enough nutrients that will protect your system and your heart. This combination ensures your body fibers and materials for cardio protection, such as Omega 3, apple pectin, garlic and antioxidants. Take 4 x Nopalin and 1 x Cholestone after every meal. Nopalin (3-4) can additionally be entered between meals with plenty of fluids. For the loss of excess fat in the desired weight, loss of appetite, bloating or solve problems of constipation, and a general improvement of digestion and peristalsis. This combination provides your body of fibers and a combination of amino acids, minerals and herbal extracts. Significantly for this combination is that the effect of Trimex be effective even as you sleep, making it the most original of all combinations and very practical. Lose weight while you sleep! Take a couple of times 3- 4 pill of Nopalin between meals with plenty of fluids and one tablespoonful of Trimex in a glass of water, a few hours after the last meal or before bedtime! For those who do not have much time or want always have a good source of nutrients, and for those who want to skip a meal and a way to purify your body! How do you eat daily? They push you pastries and fast food you eat before you can eat a fair meal at home? Thinking of meal replacements? For those who want to consciously and deliberately skip meals, not wanting to burden the new load of calories, but also want to ensure their maximum function, can apply the so-called. nutritional support !! Try a combination of urban Nopalin & Ocean 21. Without calories, with lots of fiber, for cell cleaning. Nopalin will thereby provide fiber for bowel cleansing, the binding of fat, providing a favorable environment for the development of beneficial intestinal flora and to create the necessary sense of satiety. Ocean 21 will provide a clean, water-solubilized minerals, trace elements, vitamins and amino acids that are absorbed already in the mouth by the salivary glands. Ocean 21 will directly feed the cells without excess calories. Of course, in addition it start detoxification processes within each cell. Mix one screw cap (30 ml) of Ocean 21 with 1 liter of water in the bottle and drink throughout the day. In addition, take twice (3-4) Nopalin between meals of your choice. Remember to drink plenty of water or water with Ocean 21.